Marco Rubio zings Donald Trump for repeating himself. RUBIO: You already mentioned that as part of my plan. I know what that is. What else is part of your plan? The only thing is to get rid of the lines around the states? What else is part of your health care plan? TRUMP: What the lines around the state means—and it was almost done. Excuse me. Excuse me. Excuse me. TRUMP: That brings in competition. When you get rid of the lines, it brings in competition. So instead of having one insurance company taking care of New York or Texas, you’ll have many. They’ll compete. And it will be a beautiful thing. RUBIO: Right and what—so that’s the only part of the plan? Just the lines. The interstate competition? TRUMP: The nice part about—you have many different plans. You’ll have competition. You’ll have so many different plans. TRUMP: No, I’m not—no, no, no, no. No, no, no. I don’t repeat myself. I don’t repeat myself. 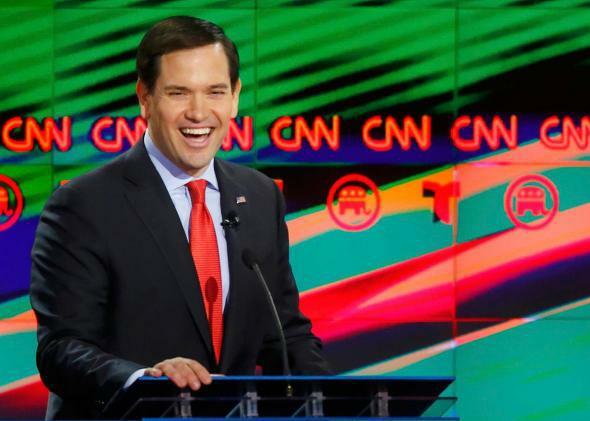 The audience cheered and, as illustrated by the picture at the top of this post, Rubio seemed very pleased.